Gordon loops these sections many times, but since each of the three is comprised of a different number of frames, they phase in and out of correspondence as the work progresses; a woman’s voice can be heard counting each positive shot, while a man’s voice counts each negative, yielding a minimalist soundtrack as remarkable as the film's imagery. Both have a rather mesmeric quality while also serving, paradoxically, to break the spell of the conventional cinematic gaze. JODI produced a number of works involving the Sinclair ZX Spectrum, an obsolete 8-bit home computer system popular in Europe in the 1980s, not dissimilar to the Commodore 64. After making a series of modifications to the ZX Spectrum game Jet Set Willy, JODI created the epic screen recording All Wrongs Reversed ©1982. 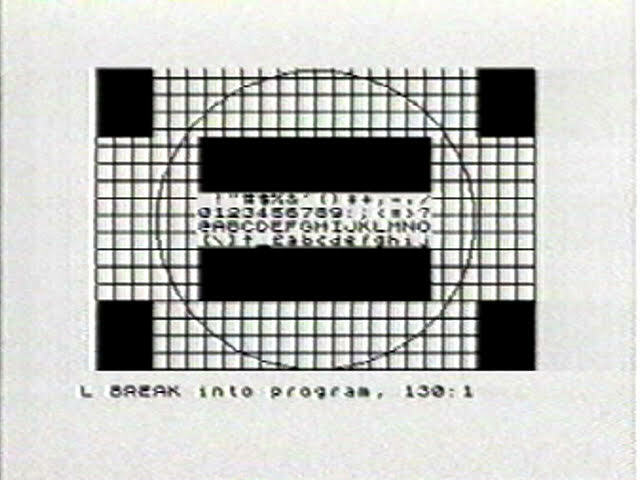 The video starts with the whining screech of data loading off of the ZX Spectrum’s cassette-tape drive, then proceeds to show JODI running and re-writing ten graphics programs in BASIC. Beginning with simple shapes and grids, which render slowly across the screen (computer processing itself here becomes a kind of animation), the video proceeds to increasingly complex compositions, replete with glitches, strobes, and pixelated patterning. We watch with anticipation as the code is slowly tapped out before us, and then witness the results, which arrive with the frisson of a musical number. The piece is at once radically transparent, diagramming in mathematical detail how each image is constructed, and, through its mutating designs and electronic drones, thrillingly gnomic. Put another way, All Wrongs Reversed ©1982 gets us inside JODI’s mind. Print of An Algorithm preserved by Anthology Film Archives with support from the Andy Warhol Foundation for the Visual Arts and the Women’s Film Preservation Fund.